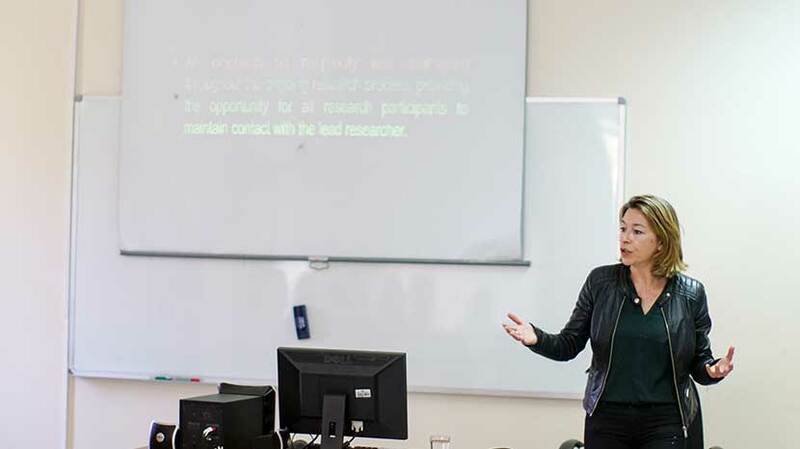 Critical analysis on the hierarchies of power in researches was offered in a lecture presented by the Professor of Youth and Community Studies in the University of Malta Maria Pisani. The lecture was organized by Birzeit University’s Institute of Community and Public Health, on April 6, 2017. Pisani presented reflections that were drawn on the Participatory Action Research conducted on behalf of UNHCR in Malta. The research offers a sound understanding of the situation of refugees on which to build effective and equitable protection strategies for all individuals and groups, including refugees. Pisani pointed out to the Participatory Action Research aims to carve a space of the voices of refugees to be heard. The research, according to the professor, focused on joint planning means and accurate tools to help attain justice all around the world. “The refugees themselves helped in achieving the research. It was thus characterized by a strong participatory component and democratic principles, wherein the voices of persons of concern are prioritized. The research sample was studies carefully to focus on all groups; women and children, in addition to the different nationalities and races,” she concluded.